This is a sponsored post written by me on behalf of BUBBA burger. All opinions are 100% mine. As someone with dietary restrictions, I cook at home a lot. By a lot I mean practically every day! 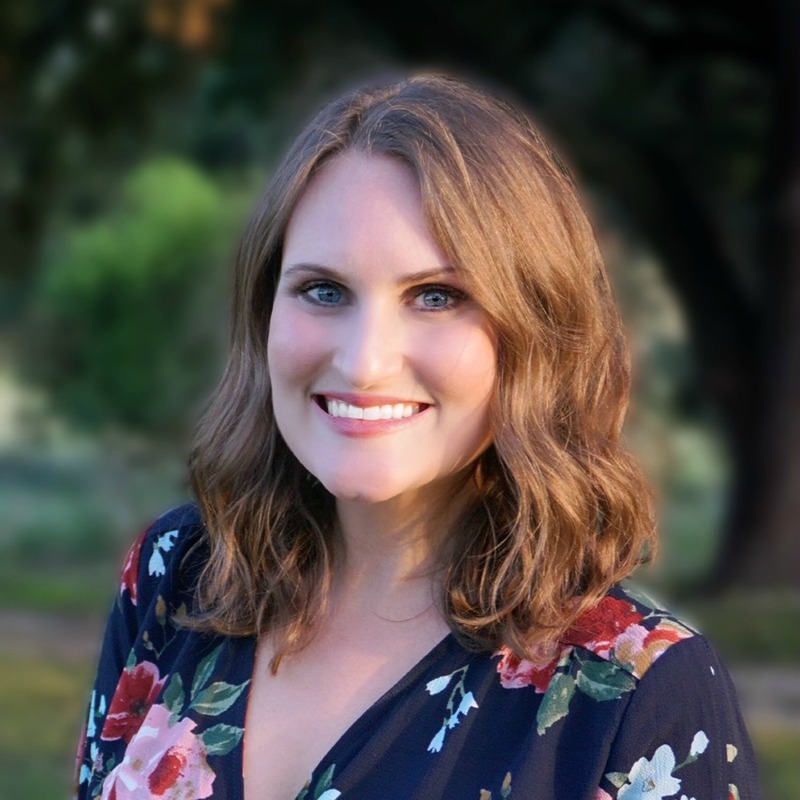 The unfortunate reality when you have celiac disease is that if you choose to eat at restaurants that have gluten in their kitchens, it’s not a matter of if you get sick… but rather when, because sooner or later you most likely will. This was a hard reality for me to accept, but after getting sick one too many times eating out I decided to eat only at restaurants that are 100% gluten free, eat at home, or cook at home and pack my food with me. The truth is… this was the BEST decision I’ve ever made! Not only do I feel great, but I’ve also been experimenting in the kitchen! Needless to say, I was thrilled when the folks at BUBBA burger reached out to me about trying their new veggie burgers! My first question was “are they gluten free?” and they said yes! The first thing I did when I received the box of burgers was examined the label for ingredients and nutritional value. I was happy to see real ingredients such as black beans, oats, flax seeds, celery, bell pepper, apples, carrots, broccoli, corn, potato, edamame, peas and lots of herbs and spices. Each burger provides 25% of your daily intake of Vitamin C, 20% Vitamin A, 8% Iron, 4% calcium, 16% dietary fiber, 4 grams of protein and only 4% total fat. Those are percentages I like to see when selecting products! When I opened the box I could see these aren’t your average veggie burgers… you can literally see real pieces of veggies in the burger! Four frozen burgers come in each box, and the best part is you just throw them on the grill straight from the freezer, no thawing necessary! That practically eliminates prep time when you’re in need of a quick, last minute meal! 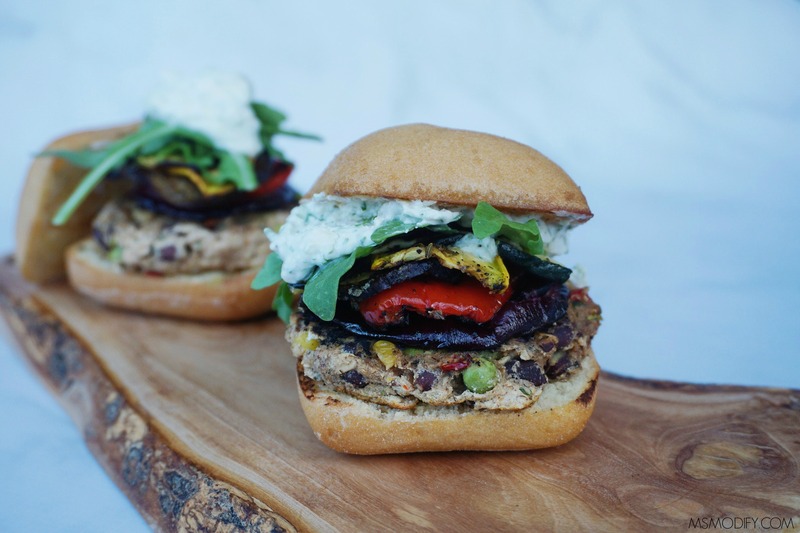 I decided to put a twist on these burgers and make Mediterranean veggie burgers and topped them with dairy-free tzatziki sauce. Start to finish you can have dinner on the table in less than 30 minutes! 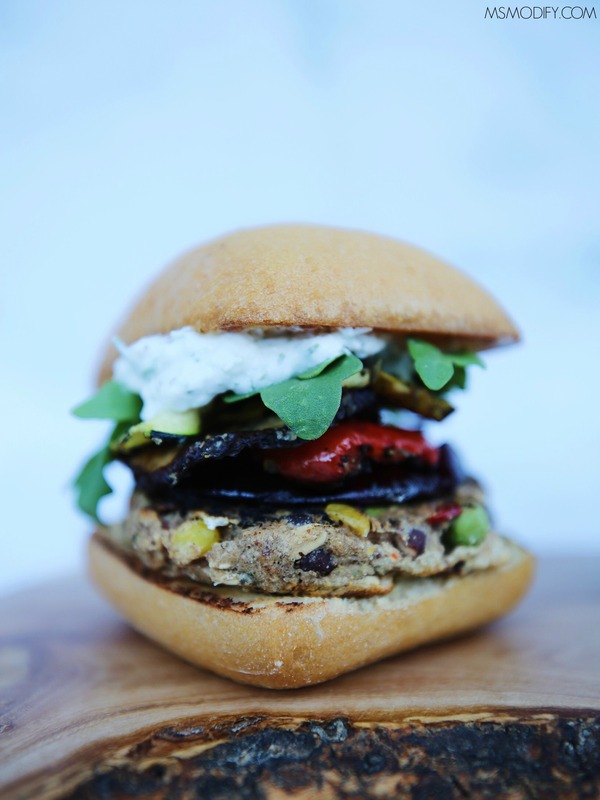 These Bubba veggie burgers held their shape well once cooked, yet were moist and full of flavor! In a food processor, add cucumber, garlic, lemon juice, and dill. Process until well blended. Put cucumber mixture into a fine mesh strainer and allow excess liquid to drain. In a bowl, add mixture to yogurt. Add salt and pepper to taste and stir everything together. Place sauce in the refrigerator as you make the burgers. Oil the grill grates and preheat grill. Drizzle the cut vegetables with olive oil and season with dried oregano and salt and pepper. Drizzle a little oil on the cut side of your ciabatta bread and set aside. Place the vegetables on the grill and cook about 5-8 minutes per side. 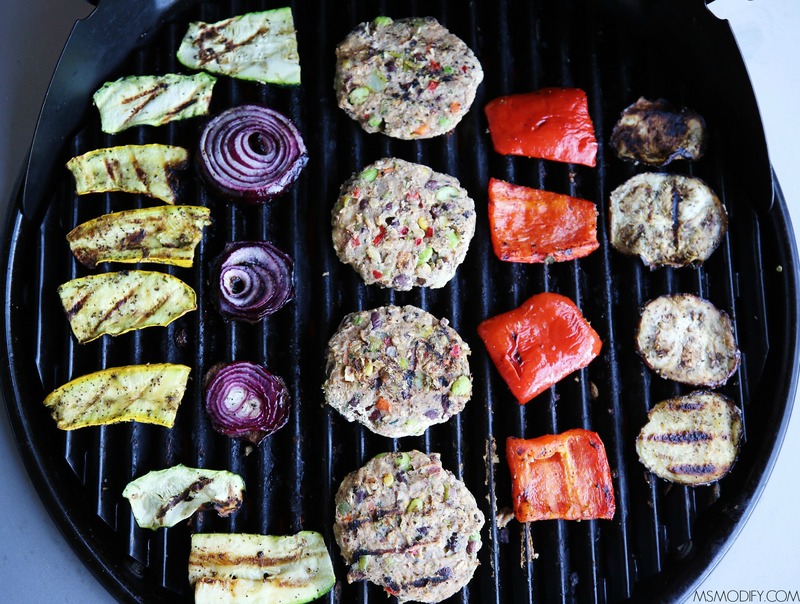 Place frozen BUBBA Veggie Burgers on the grill and cook 4-6 mins per side. Toast the cut side of the ciabatta bread. Remove everything from grill and set aside. 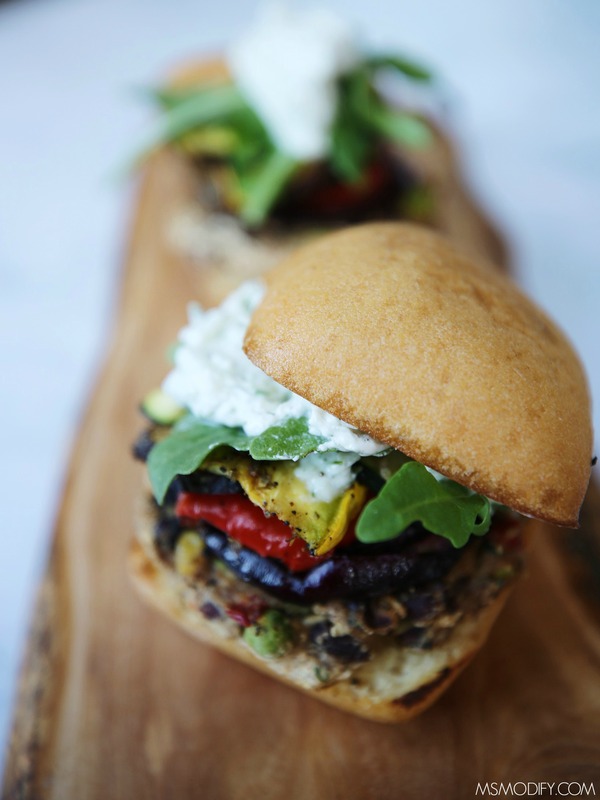 Place the BUBBA Veggie Burger on the bread, layer the grilled vegetables and arugula on top, then add your tzatziki sauce and top piece of bread. You can learn more about BUBBA Burger and find out where to buy some burgers near you! Also, be sure you check them out on Facebook! This entry was posted in Products, Recipes/Dining Out and tagged BUBBA Burger, Dairy-Free, grill, meatless Monday, vegetarian. What a fabulous recipe! 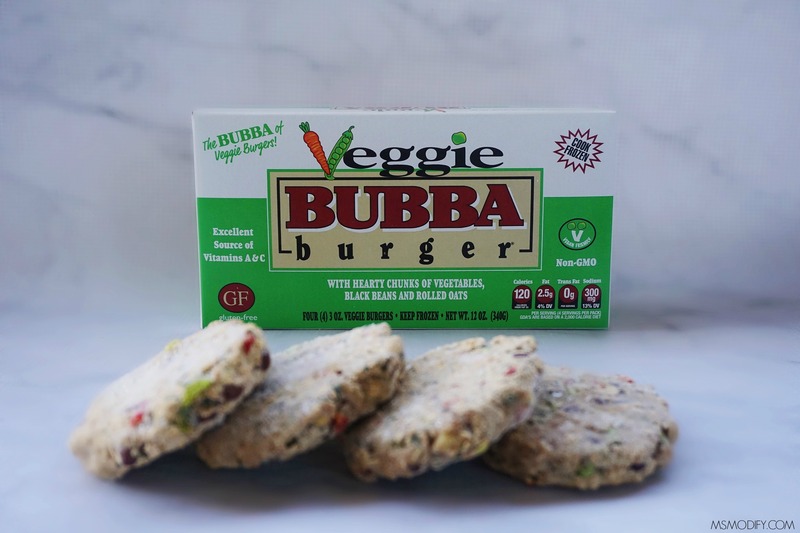 I’m going to check out my local stores to see who has the Bubba veggie burgers. We are eating less meat than we used to, so it’s exciting to see new products and recipes. It’s especially great to see vegan products that are gluten free. There are so many products made with wheat and/or gluten, that it can be disappointing. I hope to locate those burgers today, so I can make this recipe. It looks delicious. Thank you! You should check your local Target, mine carries them! I hope you enjoy the recipe!